The official Kirikiri tools should do it (no idea what is that Bluefire101 patch as I use the original ones). You don't need the game running for them and they should unpack and repacl anything with and without .sgi files and/or .exe files. I've used that for Realta Nua, be it the origina one for PS2 (after the initial unpack from the PS2 disc), the PC ones, the vita ones (though this version is somewhat easier and you don't really need kirikiri). 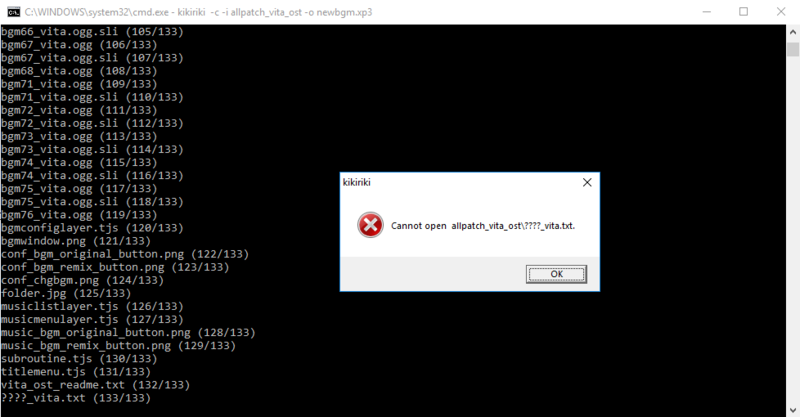 I don't think your repack somehow crashes the process, but I could be wrong and maybe something on your files is the cause of it (but I find this highly unlikely). The original version found on kikyou.info, which has been down since like a year ago. The Kirikiri Z version, modified by someone on the net; should work the same AFAIK. I'm pretty sure there are other tools, like XP3 Tools, that could let you unpack/repack without much problem, but these versions should work. Also, have you tried just leaving the folder with the correct name like that? As long as the game itself doesn't require it, the "pack" doesn't really need to be an .xp3 file; I remember testing things like that sometimes before, though I admit it has been years since I touched KAG, the last time being mahoyo. Thank you very much, I'll try them later. Also, have you tried just leaving the folder with the correct name like that? It should work like that. I remember testing things without making the .xp3 file, though this may be different with the latest versions, like the Vita ones. Doesn't hurt to try. Just make sure you place it and run it from inside the game's folder. Put the .exe in the game folder and/or open your .xp3 files directly with them. The Kirikiri Z has a simplified GUI, and should even let you open the packages on the fly almost like a .zip from what I can remember. I extracted the two files in faterealtanua_savedata and followed the instructions on the page. I had no problems extracting the Vita OST xp3 archive, but when I tried to repack the folder, the program failed to read the last file, that one with Japanese filename. It creates the xp3, but it's kinda corrupted. 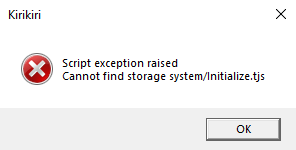 In fact, when I try to open the game, it just crashes. Even if I think it's unnecessary, I pasted the full "report" here. I would be grateful if someone knows how can I avoid this. 1) Change your locale to Japanese. 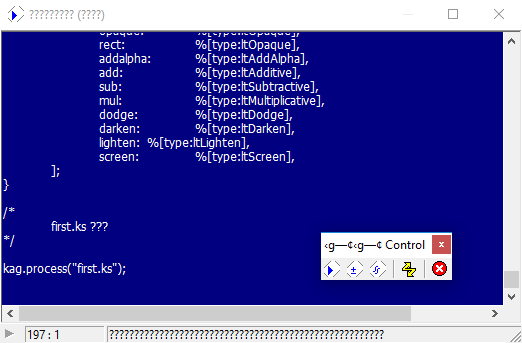 2) Use Locale Emulator to run this specific program (kikiriki) in Japanese locale.